SpaceX Launches Record 64 Satellites From One Rocket - Joe.My.God. SpaceX successfully reused for a third time a Falcon 9 rocket booster on Monday — a company first. It also launched 64 satellites from 34 organizations into space from Vandenberg Air Force Base in California. The mission, on behalf of the private company Spaceflight, set a record for the largest single launch of satellites from U.S. soil, SpaceX said. Reusing rockets is central to SpaceX’s business plan for lowering the cost of access to space. Until Monday, the company had not relaunched a Falcon 9 rocket that had already been flown into space and then returned to Earth more than twice. 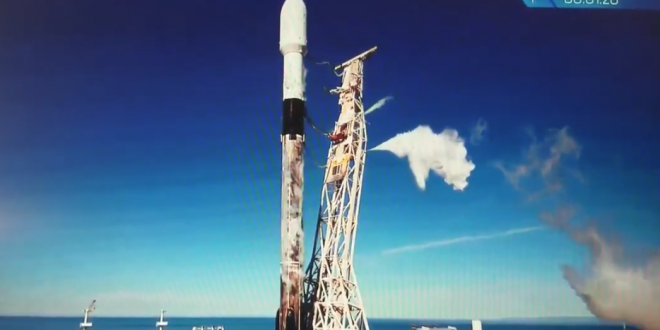 As if to put an exclamation point on the feat, the company also successfully landed the reused Falcon 9 booster on one of its drone ships in the Pacific Ocean, which means it could possibly be used again for a fourth time. Before 36-year-old James Eberling died in November 2016, he told his parents he had one final wish: He wanted his remains to be sent into space. Now Eberling’s dream is about to be realized, as his and about 100 others’ cremated remains were launched into space Monday in a memorial satellite by the company Elysium Space. The San Francisco-based company said families paid about $2,500 to have a sample of their loved ones’ ashes placed aboard the SpaceX Falcon 9 rocket.